President Harry Truman and Albert Einstein are talking for the first time in Seattle. 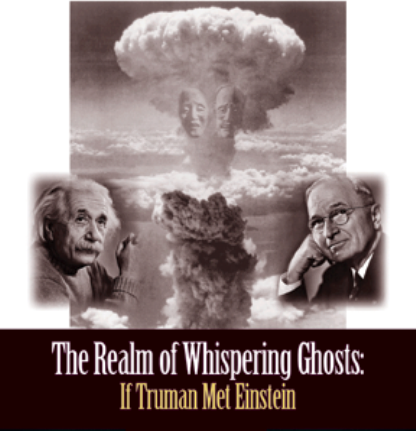 Actually, it's a "what if" play The Realm of Whispering Ghosts: If Truman Met Einstein that opened last weekend at the Bathhouse Theatre in Seattle. The play runs through September 15, and tickets are available through Brown Paper Tickets. The play revises history and asks the question "what if Albert Einstein and President Harry Truman had met while Truman was making his decision whether or not to use the atomic bomb?" Would this have changed history, and would the world be better if Truman had not allowed the atomic bomb to be complete and used? Interestingly, this production is being staged at Seattle's Bathhouse Theatre just feet from the site of the annual Lantern Floating Ceremony (From Hiroshima to Hope) that takes place. This happens every August 6th to commemorate the bombing of Hiroshima. The ceremony is the largest such gathering outside Japan, so a play asking thought provoking questions about atomic weapons, communication and war seems very appropriate to the site. The unique idea for the play arose from a history class at Seattle's Bush School. Students learning about the Manhattan Project were assigned the roles of different scientists, military figures and politicians. Their final class consisted a meeting where each student (in their assigned role) presented their case to the Truman, who was played by Seattle lawyer Mike King. King, a man with an uncanny resemblance to Truman, has played this role at the school for several years, and each year he decides whether or not to use the bomb based on the strength of the students' line of reasoning. In The Realm of Whispering Ghosts, a young Japanese girl who was a student killed when the Hiroshima bomb was dropped and an American POW she had befriended before the war are reunited after death. At the girl's urging, they attempt to stop the destruction by creating a meeting between Truman and Einstein. Their maneuverings provide the audience with many glimpses into the history of this situation and stirs up more questions than it answers. The play does, in fact, create a great opening for a discussion of nuclear proliferation and war in general, and that was the case when I attended. People wanted to talk, and they left the theatre deeply moved and open to possibilities. May such insightful portrayals bring us all closer to awakening and supporting livingry over weaponry.